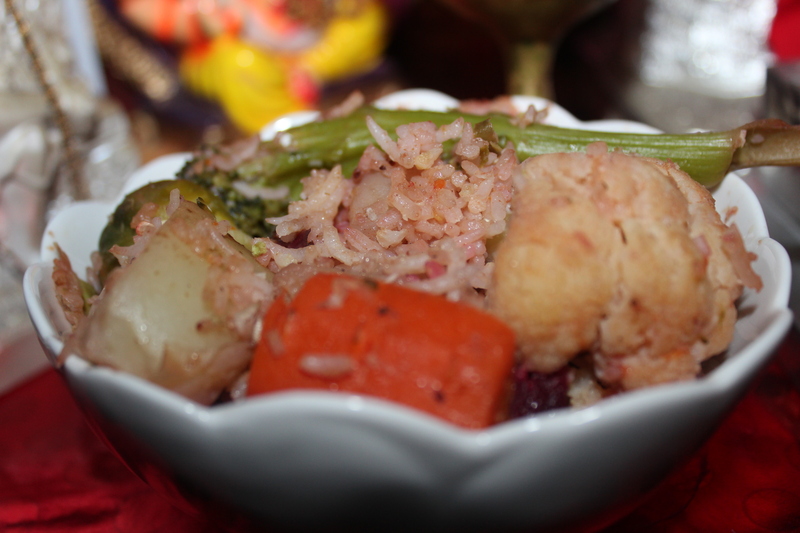 Seventh day – Sekhannam (vegetable rice) – ఏడవ రోజు – సప్తమి – శాకాన్నము. I never heard of Sekhannam in my life eventhough I know ‘sekha’ means vegetarian. I do not know the recipe per se. I found it on net. I am not able to find it now. Anyways the essence is it is made with nine vegetables and 5 spices. The recipe listed some vegetables but I would like to go with mine. 1. 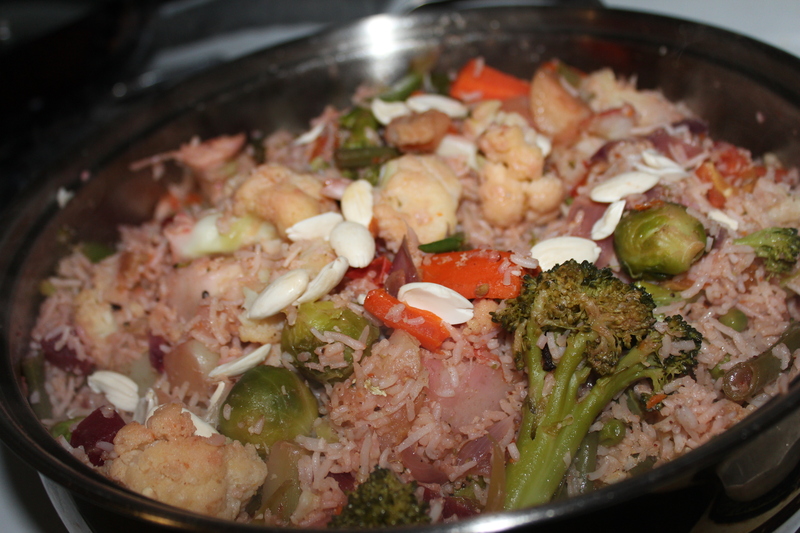 Cook rice separately in a rice cooker or pressure cooker – I usually put 1 1/2 cups of water to 1 cup of rice. 2. 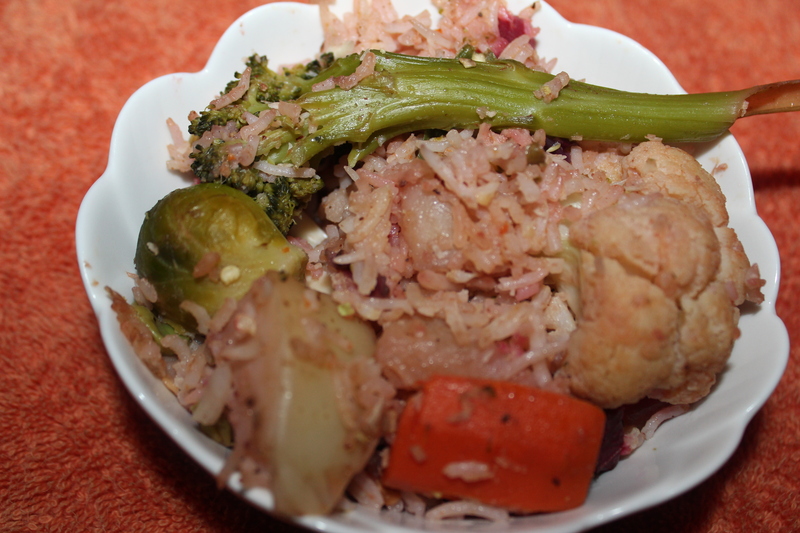 Lightly I boiled vegetables (Potato, Carrot separately, beet root separately, cauliflower and broccoli separately). I have bought frozen Brussel Sprouts. 3. Add ghee to a big pan, roast some cashew and raisins and some almond slices, then add onions and green chilly (chillies are cut into vertically, and onions too as thin long pieces) and grounded ginger , when the onions are turning little brownish, add all lightly boiled vegetables and add some salt to taste and let them cook for 10 minutes. 4. Make a powder of cloves, cardamom, and cinnamon. 5. Add the cooked rice and the spices powder, coconut powder to the vegetables container with a low flame on the stove and mix the rice well into vegetables. Leave the stove on a low flame another 5 to 10 minutes. So the Sakhannam is ready. It really came out very tasty.